For me, Tim O'Brien's The Things They Carried is the most powerful book that I have every read and it's the standard against which I judge all things O'Brien. In The Things They Carried, O'Brien utilizes a nonlinear and fragmented narrative structure, magical realism, and the power of storytelling to capture the visceral truth that telling the real story can't quite capture. For O'Brien, we must sometimes turn to fiction to capture what is "emotionally true" and, in doing so, be less concerned with an objective reality. In a way, If I Die in a Combat Zone makes this point for him. Written 15 years before Things, If I Die is a memoir of Tim O'Brien's experience in the Vietnam War. There is no metafiction razzle-dazzle, but rather a straight-forward, linear narrative that begins when O'Brien is drafted and ends as he boards the Freedom Bird headed toward home. It's powerful stuff, but not nearly as powerful as his fiction work. 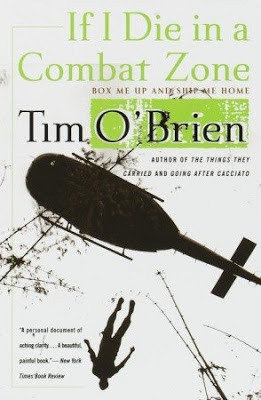 Despite that, anything by Tim O'Brien is better than almost anything else out there--fiction or non-fiction. Having grown up in the post-World War II glow of American military might, O'Brien was raised in the ask-no-questions patriotic culture of the Midwest. Real men were expected to fight. Real men were supposed to look forward to war. Real men craved the opportunity to serve their country and protect their families. O'Brien doesn't reject these values, but these views are complicated by his own philosophical inclinations. He questions the nature of bravery, as well as how American intervention in Vietnam is protecting the average American's right to life, liberty, and the pursuit of happiness. In the aftermath, he's left with no certain answers: "Now, war ended, all I am left with are simple, unprofound scraps of truth. Men die. Fear hurts and humiliates. It is hard to be brave. It is hard to know what bravery is. Dead human beings are heavy and awkward to carry . . . Is that the stuff for a morality lesson, even for a theme? . . . Can the foot soldier teach anything important about war, merely for having been there? I think not. He can tell war stories." And that's what O'Brien does in the novel--he tells war stories. He tells of the tedious days of repetition, punctuated by brief bursts of action; he tells of military incompetence and the frustration of not knowing who the enemy is in a land where farmers by day picked up guns at night; he tells of how cruel being sent on R&R was, knowing the brief return to normality would not last. And he does all of this without being preachy; he simply shows us what life was like for the average soldier and leaves us to draw our own conclusions. His language is at once poetic and precise, getting to the heart of all things. No one can capture the peculiar mix of fear, adrenaline fed excitement, and remorse of a soldier's most introspective moments like O'Brien. At one point, O'Brien ruminates on Ernest Hemingway's fascination with war: "Some say Ernest Hemingway was obsessed by the need to show bravery in battle. It started, they say, somewhere in World War I and ended when he passed his final test in Idaho. If the man was obsessed with the notion of courage, that was a fault. But, reading Hemingway's war journalism and his war stories, you get the sense that he was simply concerned about bravery, hence about cowardice, and that seems a virtue, a sublime and profound concern that few men have." It's a concern that permeates all of O'Brien's work and his treatment of it is indeed sublime.